The stationmaster's house is in private occupation. Both platforms are extant, although overgrown. 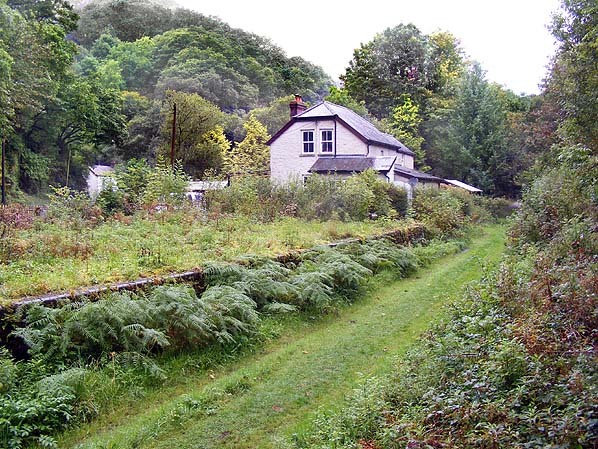 Foundations of the station building and the pit of the signal box can still be seen on the down platform when the undergrowth is cleared. The weighbridge office in the goods yard is still standing - the yard does not belong to the Gwili Steam Railway. Notes: Conwil station served the village of Cynwyl Elfed a mile to the north-west of the station. The station always used the English shortened version of the name. 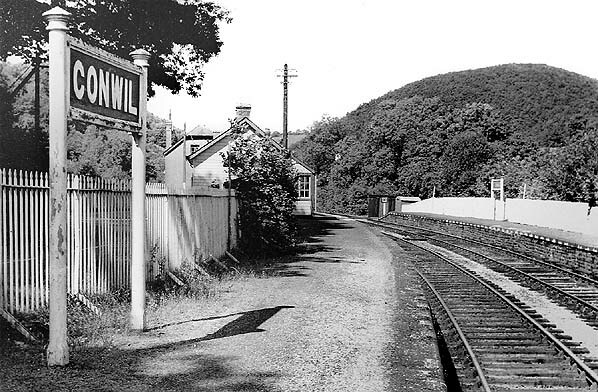 Conwyll station opened as a temporary terminus of the Carmarthen & Cardigan railway when it was extended from the first temporary terminus at Carmarthen on 3 September 1860. 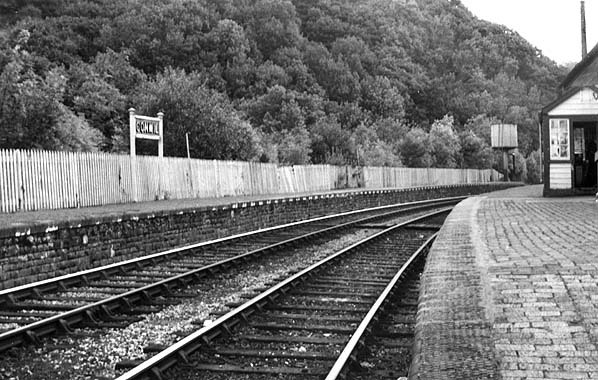 The River Gwili was diverted to allow the station to be built which is why there is a bridge over the river at each end of the station. The first train, consisting of three carriages, made the journey in 15 minutes. Following a dispute with the SWR over the high cost of providing the service over the new line, the station closed on 31 September 1860. Having obtained their own rolling stock the C & CR reopened the station on 15 August 1861. The February 1863 Bradshaw (reproduced below) shows 9 trains in each direction between Carmarthen Junction and Carmarthen. Only two if them run through to Conwyll, one mid morning and one mid afternoon. There was no Sunday service to Conwyll. The line was further extended to Pencader on 28 March 1864, and Conwyll became a through station and the name was changed to Conwil. 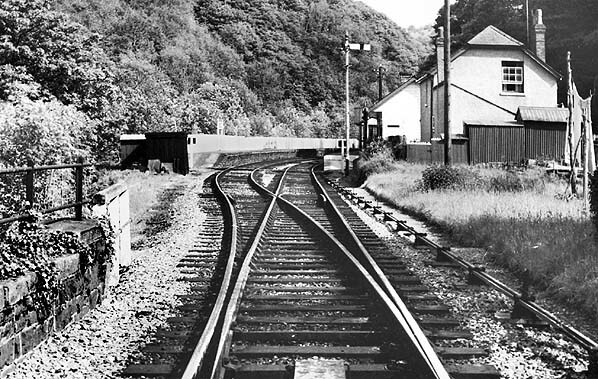 Conwil had a passing loop and two platforms. Passenger facilities were very modest, consisting of a timber station building with a pitched slate roof at the north end of the down platform; this comprised the booking office and waiting room. The two-storey stationmaster's house was alongside, just beyond the end of the platform. There were no passenger facilities of any kind on the up platform although there was, at one time, a small building of unknown purpose. There was one running-in board on each platform but no other station signs. Watering facilities were provided at the station. Water was supplied from a small reservoir on the hillside to the north of the station (it is still there - as a pond in someone’s garden), this supplied a tank to the north of the station (over the bridge). The water was then piped back over the bridge to a water crane on the down platform. The pipe then continued underground to fill the typical GWR round metal water tank at the south end of the up platform. The cast iron water pipes are still on the bridge and there was a valve half way across the bridge which can still be seen. Conwil signal box was located on the down platform at the south end of the station building. It controlled access to two sidings, both on the down side. The up starting signal was very unusual being a GWR lattice design; there are only about 30 of these made. The main goods yard was to the south of the station with the other siding to the north. The good yard included a timber goods shed with a pitched slate roof, 2-ton crane, cattle dock and pens. There were two huts near the cattle dock, one housed a mechanical trolley and the other was the shed for the Conwil to Llanpumpsaint permanent way gang. The goods yard closed on 2 December 1963 and was leased to a tarmac dealer between 1965 and 1973. After closure to passengers in 1965, the loop was lifted and the station buildings were demolished. 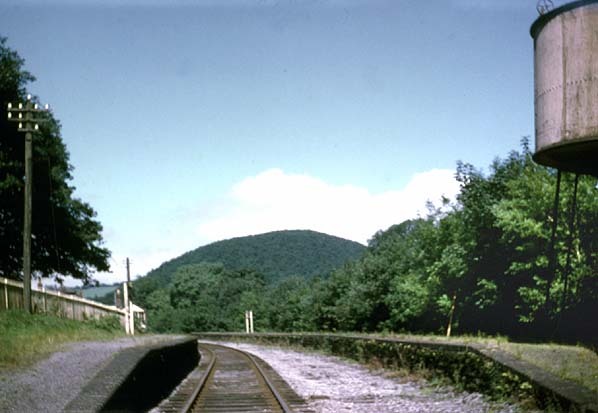 After complete closure of the line in 1973 the remaining track was lifted in 1975. 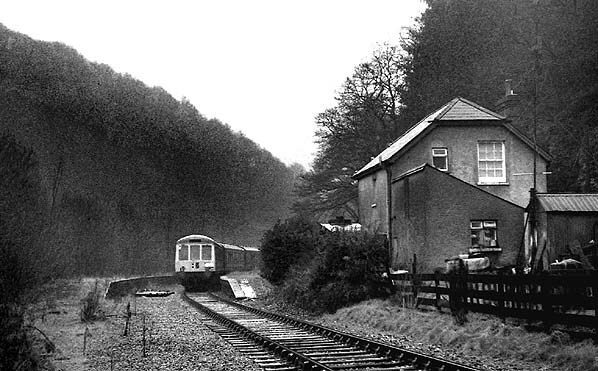 Shortly afterwards, the trackbed between Abergwili Junction and Llanpumpsaint was sold to the Gwili Steam Railway. Some restoration work has been done at Conwil other than clearing the undergrowth from time-to-time. Both platform walls were rebuilt in the 1980s from the ground up by the Manpower Services Commission. The Gwili Steam Railway eventually intends to extend its line from the present northern terminus at Danycoed Halt to Conwil, but extension southward to Carmarthen is the priority. There are two bridges over the River Gwili between Danycoed and Conwil that require expensive repairs, so the extension to Conwil is still some years away. 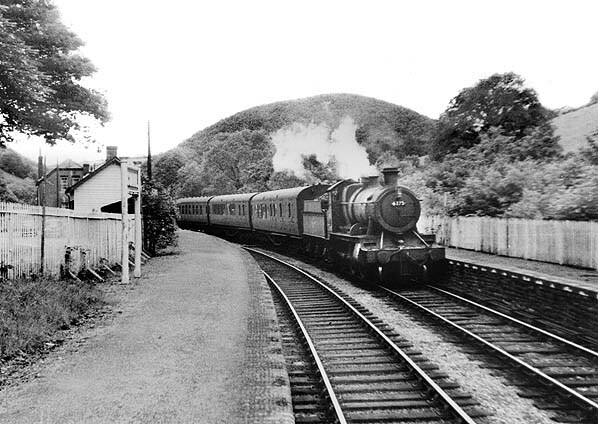 A southbound passenger train from Aberystwyth approaches Conwil station in July 1956. All the stations on the southern section of the Aberystwyth line between Carmarthen and Pencader, except Bronwydd Arms, had passing loops and two platforms. There were also watering facilities at Conwil: a water crane is seen at the end of the platform. A water tower and crane were at the south end of the up platform. The stationmaster's house is seen behind the modest station building. The signal box controlled access to the goods yard, with a siding at both ends of the station. 1906 1:2,500 OS map. The station had two sidings, both on the down side. The main goods yard, which included a timber goods shed, 2-ton crane, cattle dock and pens, was to the south of the station; the other siding is seen to the north of the station. Access to both sidings was controlled by a signal box on the platform adjacent to the station building at its south end. facilities on the up platform. 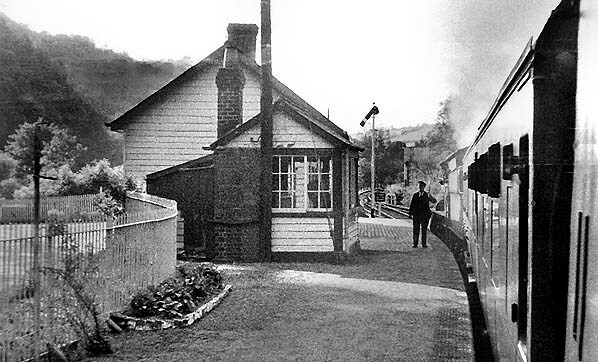 A southbound passenger train from Aberystwyth pulls in to Conwil station c. 1950s.This Churchward-designed, 43xx 2-6-0 No 6375 entered service in July 1921 on the GWR. Built by Robert Stephenson and Co, this loco had a service life of over 42 years when it was withdrawn from 87G, Carmarthen shed, in September 1963 to be scrapped by Cohens of Morriston in March 1964. Originally built with inside steam pipes, this was one of the later locos to be converted to outside pipes by BR in October 1948. Conwil station looking south-east from the down platform c. 1950s. Note the typical GWR round water tower and crane at the end of the platform. Conwil station in June 1962 seen from the 5.50 p.m. train from Carmarthen to Aberystwyth. On this occasion no passengers alighted or boarded at Conwil. 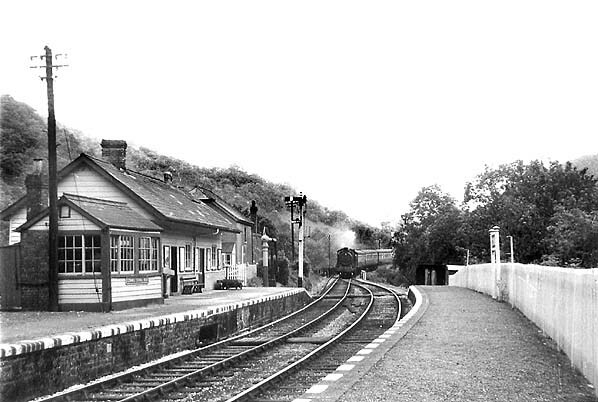 Looking south-east towards Conwil station in June 1963. The stationmaster's house is seen on the right. 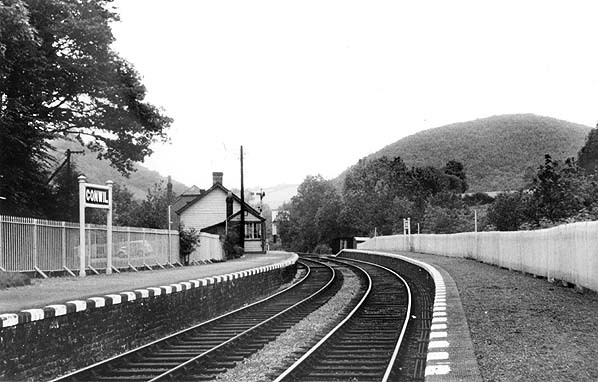 Conwil station looking north-west from the down platform c. 1960s. station on 9 December 1972. 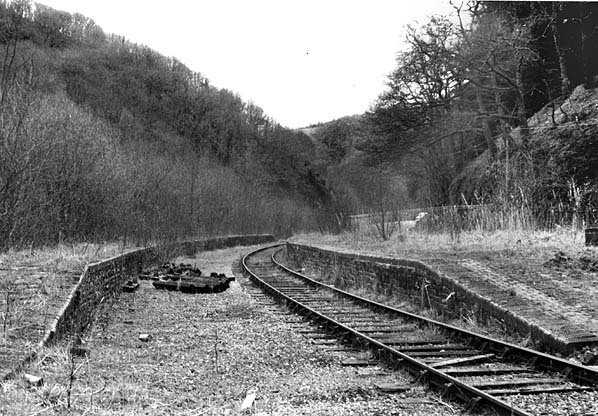 Conwil station looking south-east in April 1975 about two years after complete closure of the line. All the station buildings have been demolished, and track-lifting was to start within a few months. 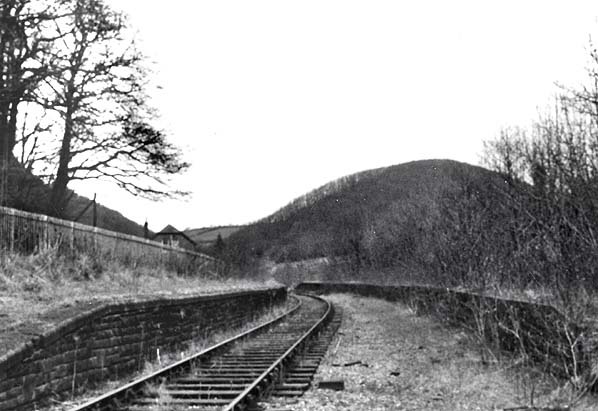 Conwil station looking north-west in April 1975 about two years after complete closure of the line. Conwil station looking north-west from a similar viewpoint to the first picture. The stationmaster's house is still standing, but the station building and signal box have gone without trace.